Poster Celebrating Women War Workers, 1918. From the National Catholic War Council records. On the 100th anniversary of the United States’s entry into World War I, The Catholic University of America is making hundreds of pages of photographs, letters, scrapbooks, and other documents available online to the public free of charge in a new website. 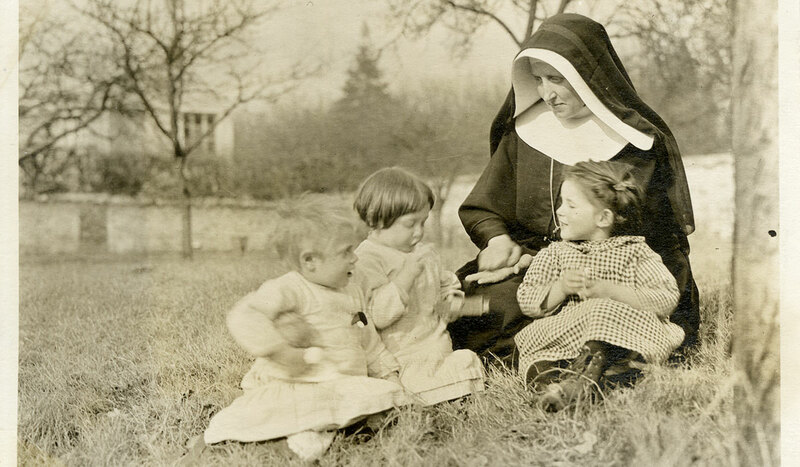 The website — Chronicling the U.S. Catholic Experience in the First World War — features material curated by the American Catholic History Research Center and University Archives, which houses the richest collection of materials related to the Catholic experience during the First World War in the United States, notes Maria Mazzenga, education archivist. When the wheels of the war machinery were set in motion with the United States’s declaration of war on April 6, 1917, five million Americans were mobilized for victory. Among those were more than 800,000 American Catholics, an often unwelcome religious minority in the U.S. at the time. The American bishops, hoping to provide comfort and service to Catholic servicemen as well as demonstrate Catholic loyalty to the nation, created the National Catholic War Council. The council became the precursor of the United States Conference of Catholic Bishops (USCCB). Cardinal Timothy Dolan, archbishop of New York and a member of the University’s Board of Trustees, recently announced that the USCCB will commemorate the centennial of the war’s end in November 2017 with events celebrating the history of the bishops’ conference. The University Archives, which holds the council’s records, among many others related to Catholic participation in the war, has made key parts of these and other collections digitally available. From the council records, the University Archives has digitized dozens of photos and documents related to Catholic soldiers’ experiences overseas, women’s war work, and the early workings of the bishops’ conference. Bringing the war experience to the individual human level, the digitized Robert Lincoln O'Connell papers chronicle the experience of an Irish-American Catholic veteran of the war in correspondence and postcards. 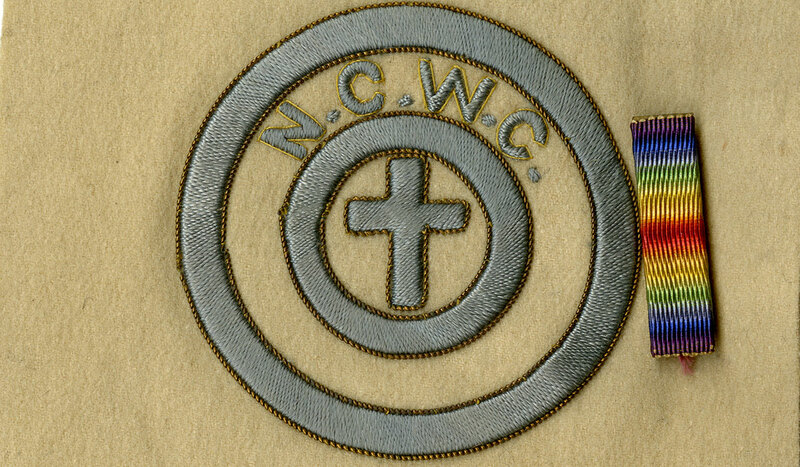 Underscoring the eclecticism of the materials, the University Archives has digitized a series of articles published by the National Catholic News Service in the late 1920s, Catholic Heroes of the World War — a chronicle of men, and some women, who won the Congressional Medal of Honor, the Distinguished Service Cross, and/or the Distinguished Service Medal. Poster from the National Catholic War Council and the Knights of Columbus. United War Work Campaign, 1918. From the National Catholic War Council records. Among these are a tribute to Buffalo, N.Y., native and future Office of Strategic Services mastermind, William “Wild Bill” Donovan. Donovan earned the Congressional Medal of Honor, Distinguished Service Cross, and Distinguished Service Medal. He was a member of the 165th Infantry, 42nd Division, American Expeditionary Forces (AEF). Lesser known heroes are also featured in the online collections. Recently digitized are the papers of Margaret Richards Millar, a descendent of Mayflower colonists who converted to Catholicism and served on the Committee on Special War Activities of the National Catholic War Council. Her papers offer an intimate glimpse into one woman’s service on behalf of Catholics in Europe. Finally, University Archives staff have compiled other resources highlighting Catholic participation in the war. The For God and Country blog post recounts the University’s role in the war, as does Catholic University Declares War. 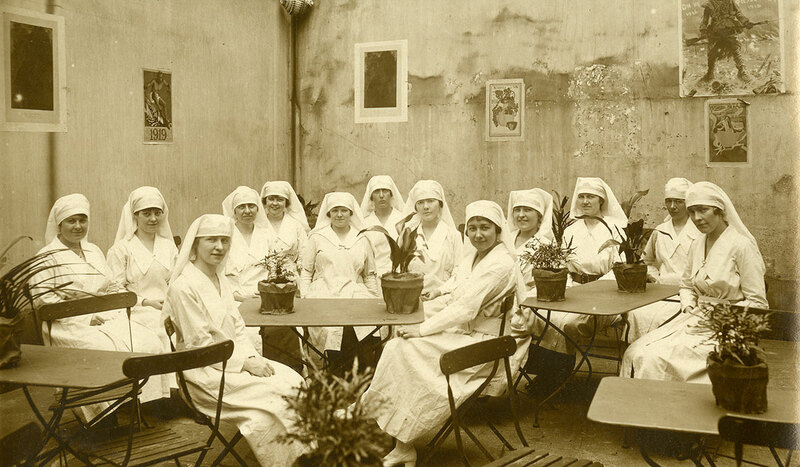 Catholic Women in World War One focuses on the role of Catholic women’s organizations in the war. 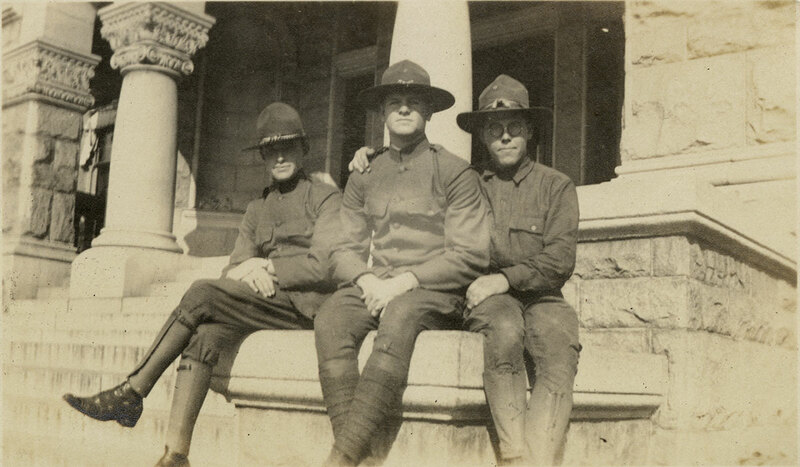 Three “doughboys” seated on the steps of McMahon Hall in 1917. Lawrence F. Wright, a member of The Catholic University of America class of 1921, compiled 78 images like this one during his years at the University from 1917 to 1921. 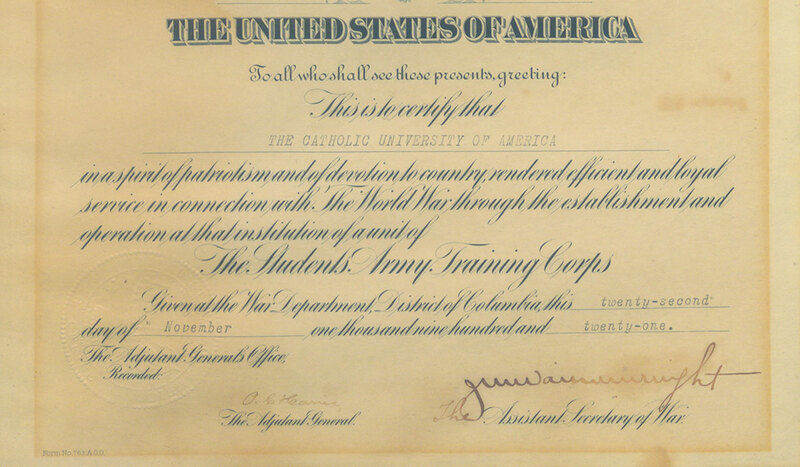 In 1921, The Catholic University of America received a Certificate of Appreciation from the U.S. War Department for the University’s establishment of a Student Army Training Corps on campus. 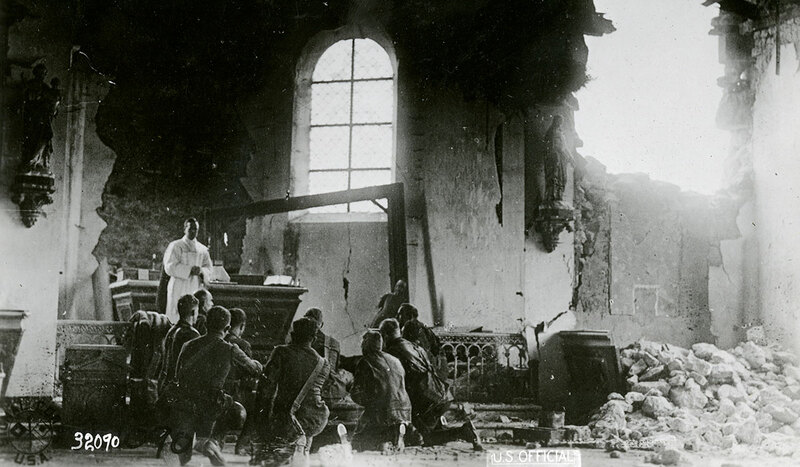 Along with this photo, the Historic Records Committee of the National Catholic War Council compiled images of religious services taken by the U.S. Army Signal Corps during World War I. This photo from 1919 shows "women war workers" sent to France by the National Catholic War Council immediately following the war. These women organized and supervised service clubs for American soldiers. From 1928 to 1933, a weekly newspaper column showcasing the heroic actions of Catholics in World War I was published. 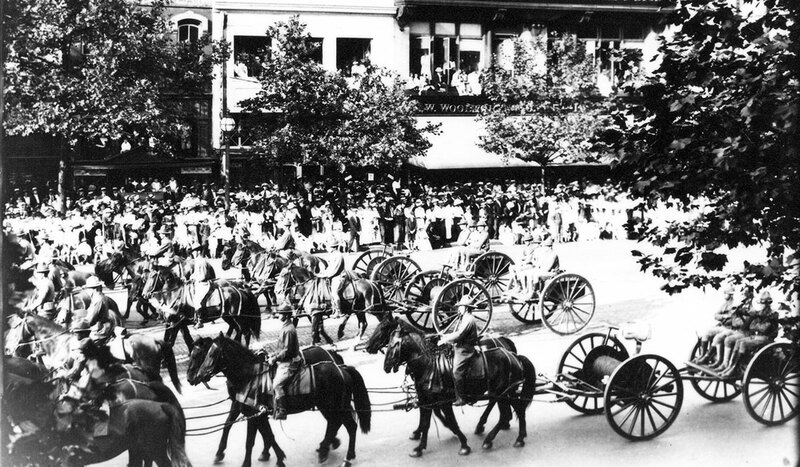 This parade in Washington, D.C., was held Sept, 4, 1917, in honor of all the drafted men from the city. This image is from a group of photos of children under the care of the Franco-American Committee for the Protection of the Children of the Frontier, which provided assistance to mostly French and Belgian children and their families.